I installed IE just a few moments ago and was using it to create this post, however, I had to finish it with Chrome because IE9 got confused about inserting images. Microsoft blatantly copied the look of Chrome and some of the features like the fact that each tab is an isolated individual process. Overall the browser seems pretty good but be sure to check your own website to make sure that it works correctly in IE9 as a couple of my client’s sites do not. One thing I find lacking is the fact that IE9 doesn’t underline misspelled words in red. I also don’t like how crammed the tabs get since they are located directly to the right of the address bar. One surprising thing is the fact that when I ran the Acid3 test to check IE9 and it consistently scored a 95/100. I thought Microsoft made huge efforts to make the browser standards compliant! I thought the results must be wrong so I refreshed a few times and received the same score. I was pretty sure I remembered other browsers doing better so I checked a few. Chrome, Opera and Safari got 100/100 and Firefox got 97/100. Finally, the big test. Benchmarking. I used the now defunct FutureMark’s Pacekeeper for the tests. 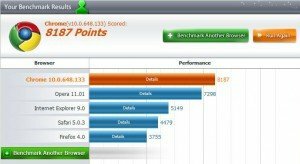 I was surprised that out of the five browsers I tested on my computer, IE9 came in third. My machine is a Quad Core Intel Q6600 running Windows 7 64 bit with 8 gigs of RAM. Benchmarks run on five browsers. In true Internet Explorer fashion, IE9 just doesn’t live up to the hype.